Died on or since – death presumed: 17th February 1917; age 24; Died of Wounds. Enlistment Location; Ipswich – 1914. Date of Entry Therein: 25th July 1915. 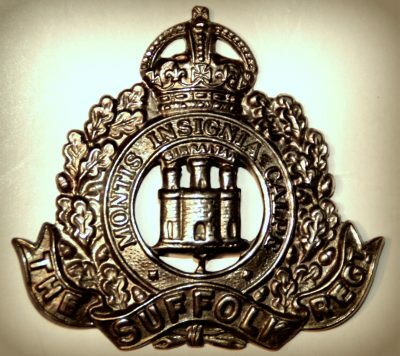 Regiment: Suffolk Regiment, ‘B’ Coy, 8th Battalion. Relatives Notified & Address: Son of Edward & Anne Brame, of Lowe Street, Hoxne, Diss, Norfolk; husband of Minnie Elmer (formerly Brame), of 20, Suffolk Road, Ipswich. 1901 Town Farm, Wortham St. Mary, Suffolk. Frank was 7 years old and living with his father, siblings, brother-in-law & nephew. Edward Brame, 53, an Agricultural Labourer, born Stowupland, Suffolk. Annie Ethel Brame, 16, born Stowupland. Thomas Harry Brame, 6, born Stowmarket, Suffolk. Ernest Bertram Brame, 4, born Redgrave, Suffolk. Wilfred George Brame, 6 months, born Wortham. Jane Goddard (nee Brame), 21, born Hadleigh, Suffolk. Alice Elizabeth Trudgill (nee Brame), 23, born Stowupland. Charles Victor Trudgill, 22, an Agricultural Labourer, born Redgrave. In 1901, Frank’s mother was a visitor to 65 year old, widower, a Road Labourer at his home – Bressingham Green, Norfolk. Annie Brame, 51, born Great Finbrough, Suffolk. 1911 South Green, Hoxne, Suffolk. Frank was 17 years old and living with his parents, brother & niece. Edward, 60, a Horseman on Farm. Thomas, 15, Labourer on Farm. Leila Brame, 6, born Wrotham. Frank S.K. Brame, born 1916, Ipswich – 1916, Ipswich. Frank is also remembered on the war memorial at St. Peter & St. Paul’s Church, Hoxne, Suffolk. “On the 17th the advance towards Miraumont began,8th battalion 05:45 am under very trying weather conditions, severe frost which lasted for a month suddenly breaking on the eve of the battle and rapid thaw converting the ground into a morass of the worst description. very few duckboard tracks existed there at the time, and the nearest hut being over two miles from the front line, the carrying parties had a most difficult task. The process of forming up for attack had to be carried out at night in a thick mist and under a hostile barrage as well-zero hour having become known to the enemy. The battalion gained its objectives quickly in spite of stubborn fighting in the front of the uncut wire, and the leading waves succeeded in establishing themselves within a few hundred yards of Petit Miraumont. The work of consolidation was rendered less difficult by the mist, which prevented enemy observation and permitted freer movement across the open than normally possible.